Now the problem is that I can't really describe the base chocolate ice cream itself. It seems to be a good flavor and texture, but the chocolate chips are so plentiful that they run the whole show here. It's not a bad thing, just be prepared for it. 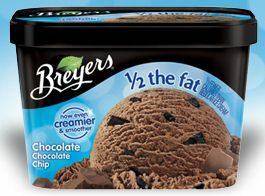 If you just want ice cream (and I will try the plain chocolate at some point), go with the straight chocolate. If you want to crunch chips 'til your heart's content, then go with the Chocolate Chocolate Chip. I would like to make one comment, just a minor point to keep in mind if you are watching calories. The point of smooth and dreamy is all about 1/2 the fat and less calories, and while most of the S&D varieties clock in at 2 grams of saturated fat, this one has four because of the chips. Nothing major, but just keep it in mind. Ok, and now for some TV...something to distract me from having another bowl of this stuff right now. Have I mentioned I really like this ice cream? MMMMMMM....really need to think about something else now. 2012 Update: This flavor does still exist, but the "Smooth & Dreamy" moniker is dead. It's no longer all natural but should be "even creamier & smoother". This results in slightly different nutrition stats. 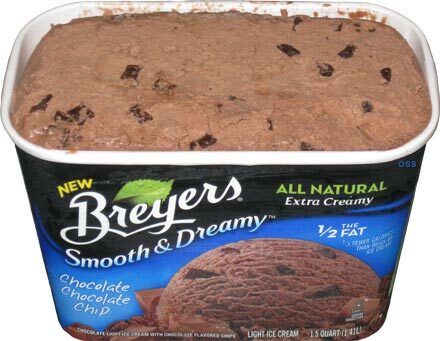 WHY can't I find this delicious CHOCOLATE CHOCOLATE CHIP (smooth and creamy) in any of the many supermarkets I frequent?? It's my favorite .....all stores that DID have it, no longer do....WHY??? I wish they would bring this back!!! I have looked every where and of course no one has it any longer due to Bryers not making it!!! Can you please bring back chocolate chocolate chip ice cream.